Pours out of the bottle a beautiful sunset orange with some reddish and amber highlights, with a huge topping of creamy, off white foam. The aroma is complex and definitely fresh smelling. Malt, biscuit, pine, fruits, orange zest and a lemony grassy note. The beer is creamy and starts off with a tangerine fruitiness with sweet malt upfront and a bubbly and bitter center that fades to an herbal and earthy hop finish, with some leafy green grass qualities with a lasting bitter citrus rind twang of a finish. This is a very fresh tasting American IPA, but isn’t as bitter or intense as I expected. The hops taste fresh but do not completely dominate the brew. Very good sipper, I suggest pairing with some slightly spicy dry rubbed ribs, a good burger, or step it up with grilled pork chop with a fruity sauce. Again don’t worry about the weight of the sauce, the carbonation of the beer will stand up. The beer is copper colored with a tight creamy off white head and very sticky lace. It is very herbal and floral to the smell. There are notes of lemon and grapefruit, with orange peel. Overall, very fresh smelling with some caramel and biscuit. Upfront the beer is malty, with some grain, and then a citrusy grapefruit burst in the center with a grassy bitter finish. It has a resiny stick, and is highly quaffable. The fine balance of biscuity malt and bittersweet citrus makes it intriguing and delicious. Grab a bottle when it comes out this spring! Pours a light burnt sunset orange with a capping of white foam. Really beautiful bright color and enticing appearance in the glass. A sweet bready malt aroma up front, followed by bittersweet citrus and other fruity hop notes. Orange peel, Lemon peel, apricot and pear skin are all apparent. An effervescent and bitter blast followed up by some pale malt then a bitter grapefruit finish with some fading earthy hops. It’s creamy on the palate with bright carbonation. A light and refreshing bitter hop blast. It would go really well with Mexican or spicy Thai food. All the fruity notes will blend with most Thai sauces and the carbonation will lift any coating flavors. A lightly seasoned grilled salmon would also go really well. The IPA is a great grilling beer and the carbonation will cut through the fat and let the flavors of both the beer and salmon be showcased in harmony. Pours a dark copper with some orange/amber highlights with a full khaki head. Sweet caramel malt in the nose with some bright hop fruitiness and pine. Apricot, pineapple, mango and earthy hops are most noticeable. The caramel sweet transfers from the nose and into the flavor with bready malt upfront which then transforms to a moderately piney and floral hop that fades into a bitter and lasting, dry finish. Nice bitter hop and sweet malt flavors gives a nice even balance and makes for a tasty IPA. 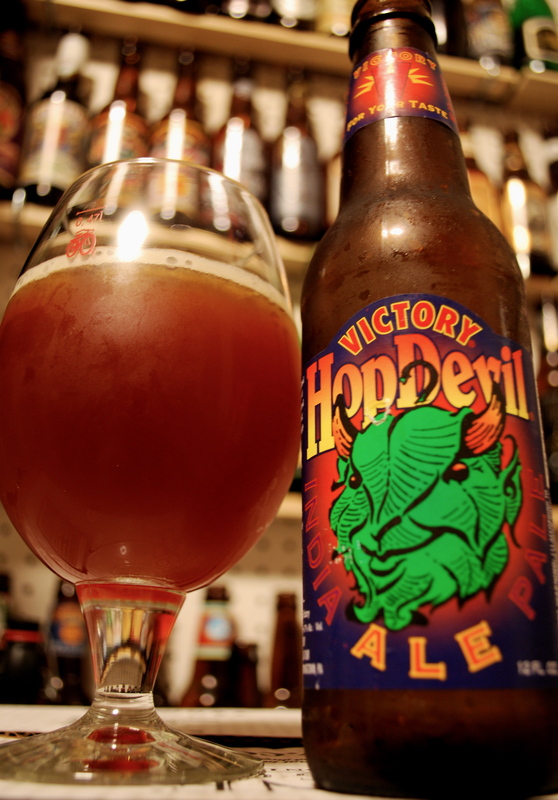 I suggest some grilled chicken or salmon to go with Hop Devil. Spicy Pad Thai would be a nice match as well. Pours a light copper/amber with an ample and frothy khaki head, of course with more sticky lace. The glass is full of light grassy and earth tones with a hint of fruitiness, fresh flowers and caramel malt throughout. Freshly cut grass, resinous pine, grapefruit rind and earthy hops all culminate to a bitter finish. Bubbly mouthfeel, medium body and a bit sticky from the hop resins. I suggest Indian, stir fry maybe spicy crab cakes. The hop profile will play into the spice and remaining powerful enough to cut through the shellfish. 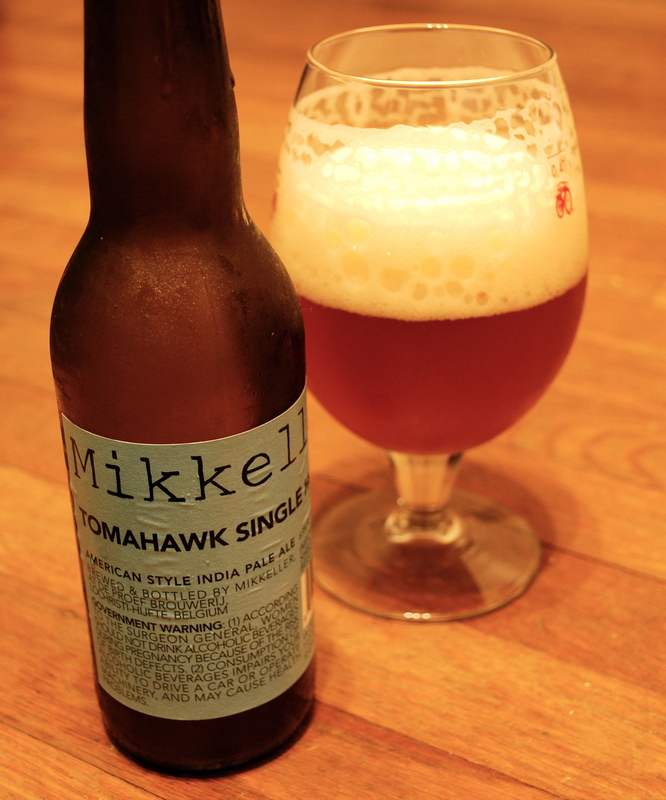 First let me start out by saying that I am a big fan of the Tomahawk hop variety. Obviously a badass name, but besides that, it is the first commercially grown “Super Alpha” variety. It is called such because of it’s high level of alpha acid (14-18%) compared to the (4.5-6%) Cascade, or even the lower still ~3% Saaz hop used in pilsners. Simply put, without going to deep into the brewing process, alpha acids are responsible for IBUs, or the amount of bitterness in the beer. Pours a bright copper with an off-white meringue head with sticky lace. Gives off a floral and fruity aroma with notes of pine which then flourishes into fruity pineapple, mango skin, apricot, green banana, grapefruit and some lingering grain. The taste is of pine and bright, tart grapefruit, with some herbal and earthy tones followed up by malt on the back that barrels into a delightfully bitter finish. Creamy and well carbonated, with a medium body, just as the previous beers in the series most likely due to the same grain bill used to create identical beers, with just different kinds of hops used. All the great aspects of Tomahawk are on display in this really well done IPA. My favorite so far. Try it with some brie and crostini. Also BBQ chicken came to mind while drinking it. The tangy sauce would dance with the bright tart flavors of the hops. Hazy dark apricot color, with a large creamy off-white, sticky head, that leaves lacing around the glass. Bright fruity floral aroma with notes of pineapple, orange pith, fresh flowers, ripe pear and pale malt underneath. Floral and bright flavors on the palate. More pineapple, orange and tangerine, some banana and bready malt in back. This beer is minimally bitter, more fruity, with an expected grapefruit finish. Creamy mouthfeel, with prickly carbonation. A very tasty IPA, great drinkability. Try it with a summer salad with grilled tuna. 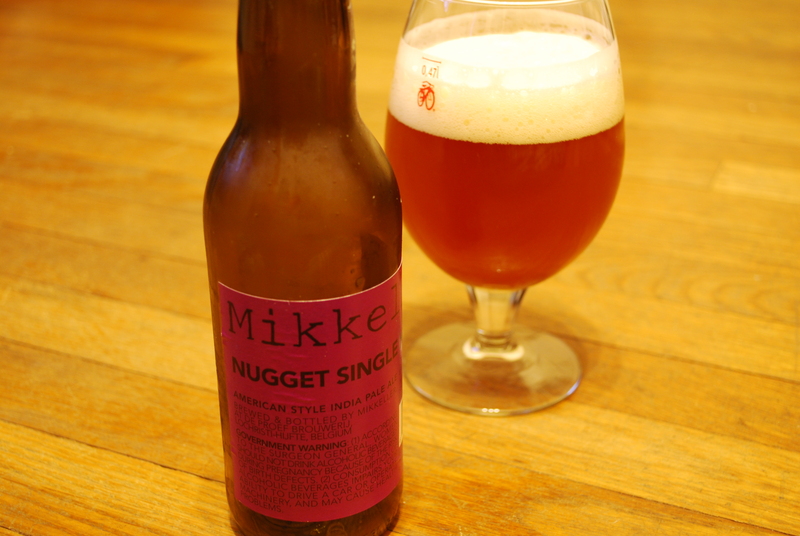 This is another beer from the Single Hop series from Mikkeller. This beer pours a light copper with burnt orange highlights, which produces a creamy, dense and sticky head. 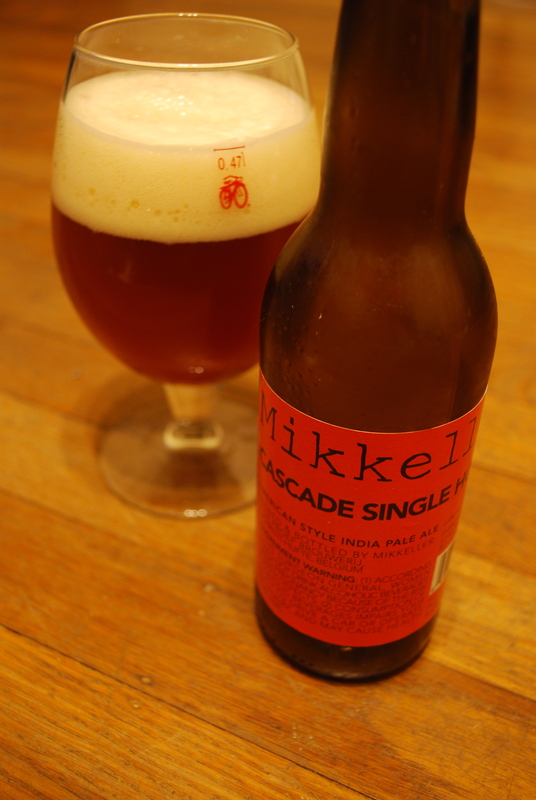 Its aroma is extremely fruity, with a malt undertone. Fresh pine transforms to tropical fruits like pineapple along with apricot, orange and red apple. The taste is bitter from the very first sip, with some malt, then an explosion of pineapple, orange and apple, unripe banana then earthy, herbal hop flavor on back with a hint of tobacco in the bitter finish. It has a smooth mouthfeel with a medium body, very refreshing and a good straightforward hop character with nice even malt. This is not really a pine or grapefruit bomb that most IPA’s embody, but it has some great hop profile. The assertive quality of the beer will pair well with pungent cheese. A good goat cheese will do well with this beer, the carbonation will lift the cheese off the palate and the flavors will blend well. I also would love to try this with a prosciutto Panini or another salty meat would contrast well with the flavors in this beer. Another good match would be something like Chilean seabass with some mango chutney or pico de gallo and some chiles. 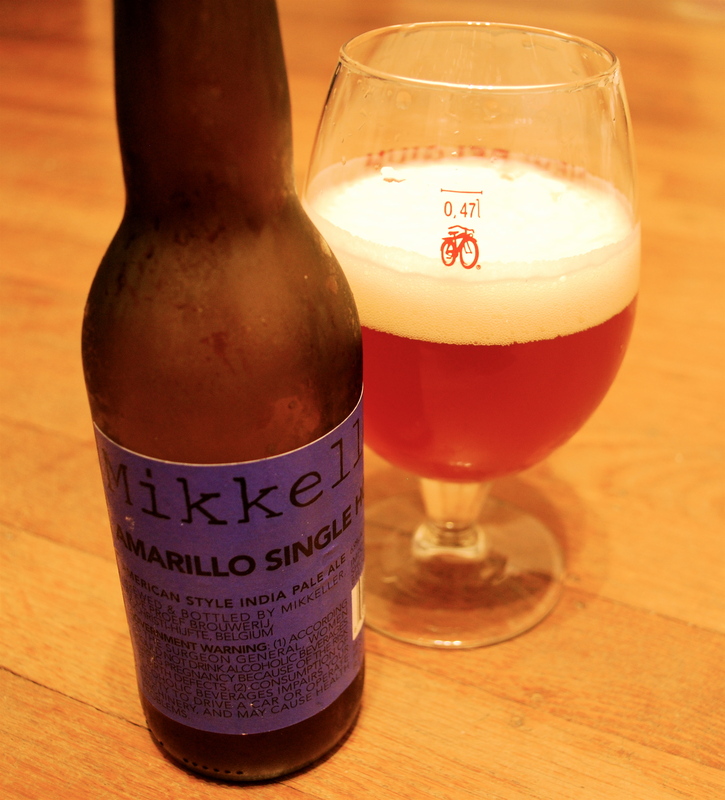 This beer is part of Mikkeller’s Single Hop Series, which I think is incredible. Pricey, but awesome, nonetheless. At $5.49 a 12oz. bottle it’s a bit of an investment per ounce but definitely worth experiencing a single hop in all of its glory. As to what extent that glory goes, is up to your own taste buds. This is a great way to find out what hop flavors you like as well as giving you a mental inventory of hop flavors so you can identify what hop varieties are in what beers. How well this works to impress girls is up to you. Here’s my review of he Warrior Single Hop IPA. Deep amber in color with hazy, burnt orange highlights. Develops a bountiful and creamy off white head with lasting retention. The aroma is the distinct pine that I have grown to love. Pine and grapefruit are smells I find myself craving in my beers when just a few years ago I would have rallied against that in my glass. In addition to pine, a floral aroma is present along with earthy and leafy green notes, like fresh cut grass. Some biscuity malt on back with a touch of fusel alcohol. The drink is briefly sweet but as the creamy beer flows over the palate, lively carbonation attacks with a powerful piney bitter bite with notes of green grass, lemon, and grapefruit rind. The burst of carbonation reveals a resounding bitterness that lasts through the finish. 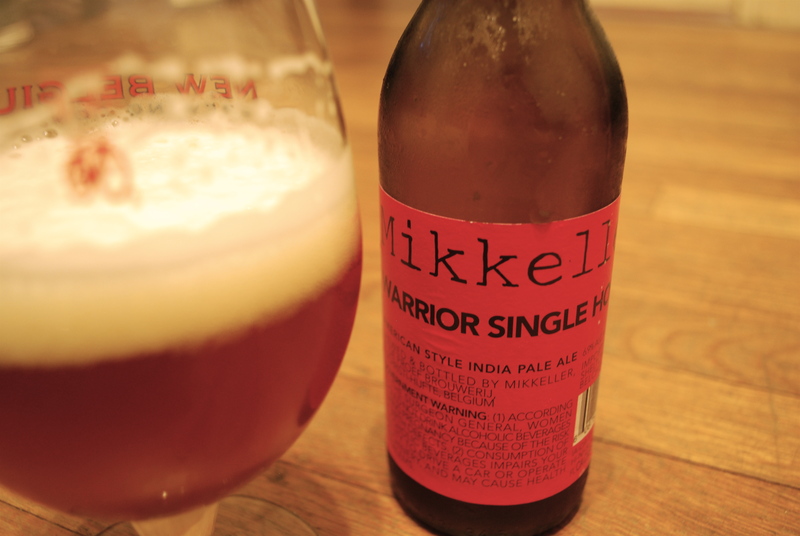 Mikkeller Warrior IPA is very bitter, but very tasty and it is not very complex, but the simplicity is where the beer succeeds. This would be a great beer before dinner (as long as you let your tongue recover from the hop attack). It will cut through the fats of guacamole and the carbonation will lift any cheese you choose off your palate. I think the lemon aspect will go great with grilled chicken and it would be delicious with Brie, but then again, what isn’t? If you really want to amp up the aperitif bitterness, try an endive and radicchio salad with simple vinaigrette. This is a wet hop American IPA. Wet hopping is somewhat of a rarity as it is very time sensitive. Dry hopping is something which is done more often in beer, where dried (usually in pellet form) hops are added to steep in the fermented bee. This adds hop aroma. Hops are added during the boil of the ingredients at different stages: for bittering, flavor and aroma. The less time the hops boil, the more they move from bittering to aroma. Wet hopping uses freshly picked and undried hop cones to be added to the beer while being fermented. 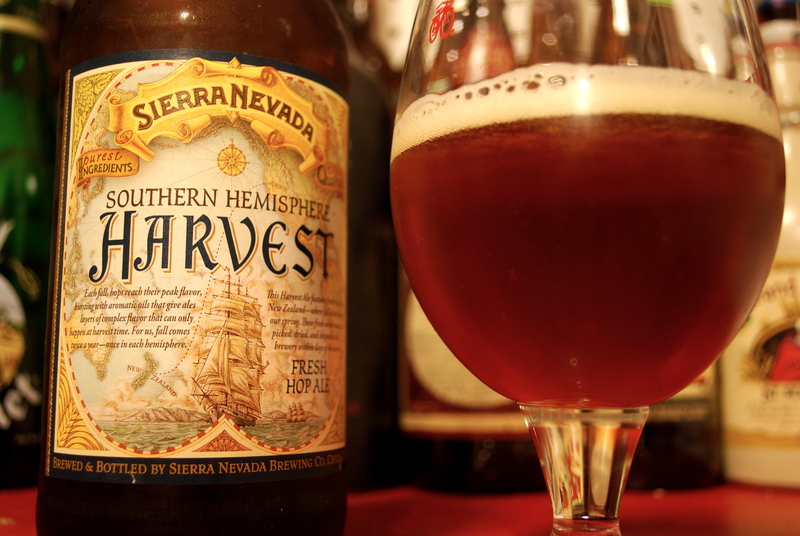 Sierra Nevada ships Cascade and Centennial hops from the Yakima valley in Washington to Chico, CA where they add them to the beer for a fresh, green hop flavor and aroma. Pours a clear light amber with orange highlights and a frothy, off-white head that leaves a sticky lace around the inside of the glass. Smells of sweet pine, with grassy notes and some citrus. There is some malt on back with bready notes. The first sip reveals green pine flavors, tart grapefruit and floral hops on the back with a bitter but bright finish, and a touch of malt in the background. This beer has a deliciously creamy mouthfeel and has a medium to full body. The bittering from the hops is dead on perfect. It’s not too much, a perfect amount for a good hop bite in the back with great fresh hops up front. 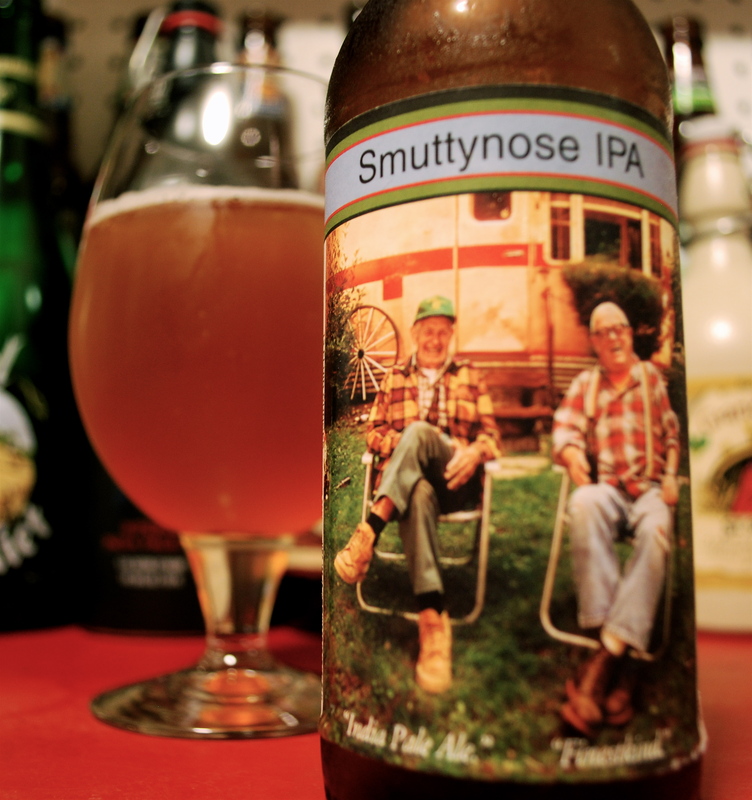 This beer is extremely drinkable, and it delivers awesome hop flavors. A must drink for hop-heads. 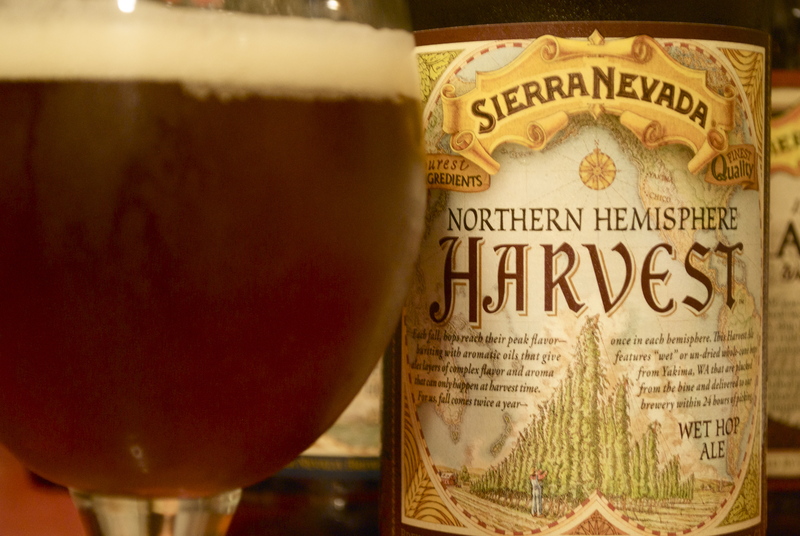 The balance definitely favors the hops, but malt is not this beer’s focus. 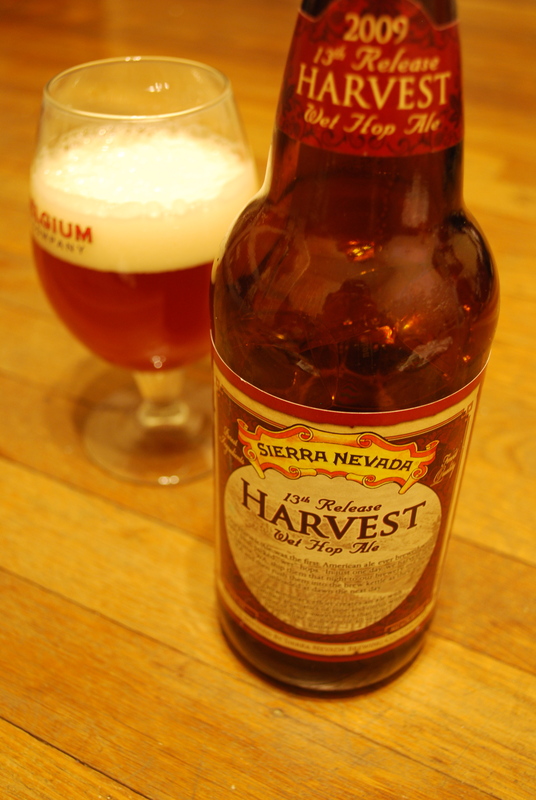 The Harvest and “wet hop” promises, and the taste delivers. My suggestion: this will go great with some lamb or ribs. Make sure to drink it fresh. Don’t let all that hard work to deliver it fresh to you go to waste.